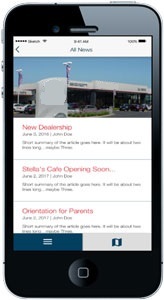 An automotive giant partnered with Imaginet to create an innovative mobile app that assists employees and guests with navigating and discovering their new corporate campus. With the construction of a sprawling and beautiful new corporate campus, this automotive giant knew that employees and guests would have a challenging time navigating and taking advantage of all the amenities on their new multi-acre campus. This company partnered with Imaginet to create My Campus, an innovative mobile app that assists employees and guests with navigating, discovering campus events and key locations, reading corporate news, sharing locations with colleagues, and accessing internal applications. This custom mobile app transformed their corporate campus navigation, saving valuable time and delighting their mobile app users. 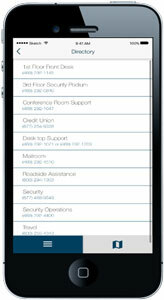 Quickly find important phone numbers, addresses, and navigation (wayfinding) instructions to key campus locations. Discover important corporate locations near you: dining, restrooms, parking, office buildings, meeting rooms, etc. 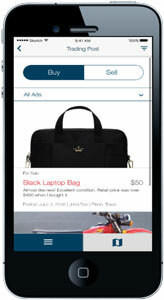 Buy and sell personal items with your coworkers on campus on a secure, corporate-only Trading Post feature. Discover and register for events across your campus. 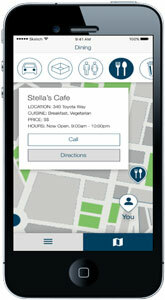 Easily navigate to event locations with the simple wayfinding feature. Stay in-the-know on all corporate and campus news and highlights – 24×7, right at your fingertips. 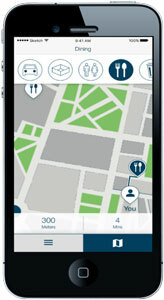 Easily navigate from one campus location to another without getting lost or frustrated with the simple wayfinding feature.